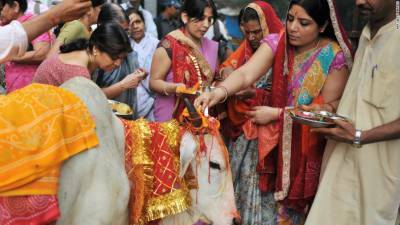 New Delhi: On Friday against all odds Indian Supreme Court has denied a national ban on cow slaughter, in a country where cow is sacred for more than 66 percent of population. The Supreme Court dismissed an activist's proposal to prohibit the slaughter of cows across India, a measure that would have effectively banned beef consumption in a nation of 1.25 billion. Millions from India's huge minority populations -- including Muslims, Christians and lower caste Hindus -- eat beef, which isn't widely available and is banned altogether in some states. On the other hand, Cows are revered in the Hindu scriptures as the 'mother' of civilisation and many worshippers equate the slaughter of cows or eating beef as blasphemy. Just eight of India's 29 states permit the consumption of beef or the slaughter of cows. "One state may ban slaughter, the other may not," the court said in rejecting the petition. "We will not interfere in state laws." Several radical religious groups, and the Hindu nationalist Bharatiya Janata Party (BJP) of Prime Minister Narendra Modi, have long campaigned to implement a nationwide ban on cow slaughter. The BJP won national elections in 2014 with a thumping majority, pledging in part to ban cow slaughter. But so far the government in Delhi has failed to convince the states to pass such sweeping measures. Simmering tensions over the issue have spilled into violence since BJP's national ascent to power, with a string of attacks on minorities by right-wing Hindu vigilantes resulting in the deaths of at least 10 people.